Founded in 1995, Royal Roads University (RRU) is a respected public applied research university located in Victoria, Canada. It was previously established in 1940 as Royal Roads Military College. Royal Roads University’s campus and surrounding grounds are located on the beautiful Hatley Park National Historic Site. Declared a national historic site, the University campus sprawls over 565-acre of lush parkland, oceanfront backdrop and scenic view of the majestic Olympic mountain range. The beauty of Hatley Park and Hatley Castle has become a preferred prestigious destination for local and international film crews. Movies and TV shows previously filmed include the X-Men movies, Deadpool, Arrow and Smallville. 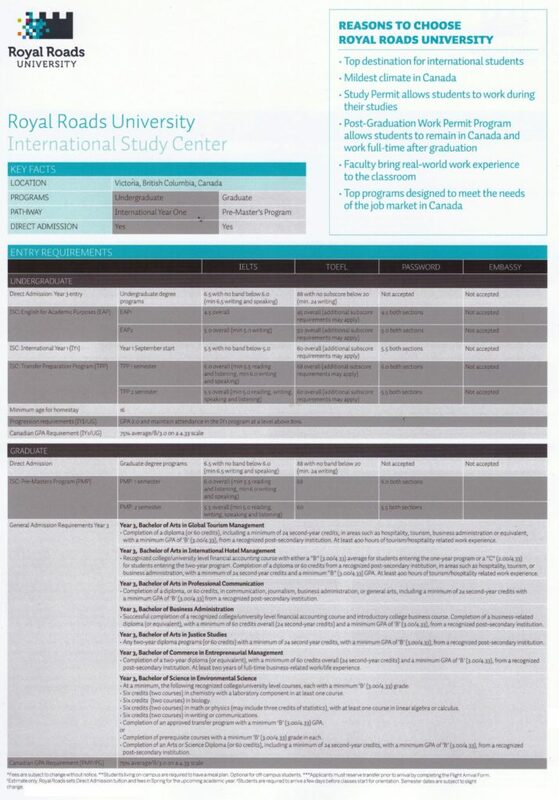 Q21 Rankings of National Higher Education Systems ranked Royal Roads University 4th Best Higher Education System in the world in 2013, offering students high-quality education and a high standard of living, without the high prices charged in other countries. The University offers programs in areas of Business, Communication & Culture, Tourism & Hospitality, Education & Technology, Leadership Studies, Environment & Sustainability, Humanitarian Studies and Interdisciplinary Studies. Completion of BA Global Tourism Management and BA Professional Communication in 1 year for suitable applicants. 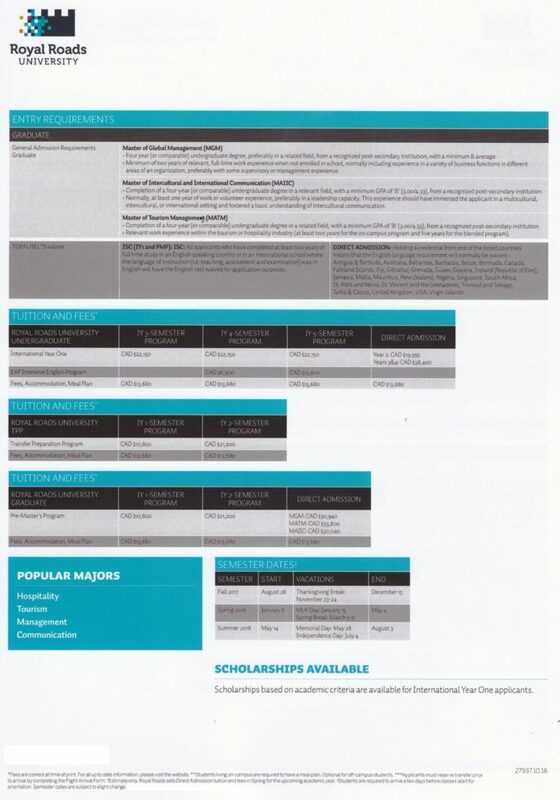 Entry into Year 3 of university also for suitable applicants.